I know people hate this and I know I should be taking the time to test test test multiple glazes but truth is I don't have the time. I had a dear friend ask me to make a run of mugs for her and glaze them purple (long story behind the request that I'm sure no one is interested in but, it is a heartfelt gift that she is giving a group of friends to honor a friend that passed away). 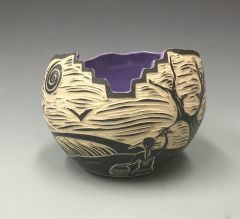 I don't have a purple glaze and this is going to be a one shot deal, so I am asking for a tried and true cone 6 oxidation glaze for white stoneware. Shade of purple isn't important but it would be nice if it was food safe so I wouldn't need to use a liner glaze (which I do have if I must). So if you have a good purple glaze I would appreciate the share so I can do this project for my friend in a timely fashion. I dip and spray my glazes and usually mix my own but if it is necessary I would try a commercial glaze to get this project done.